This easy-to-use, rich gel formula quickly restores optical clarity to both rigid and flexible clear plastics. 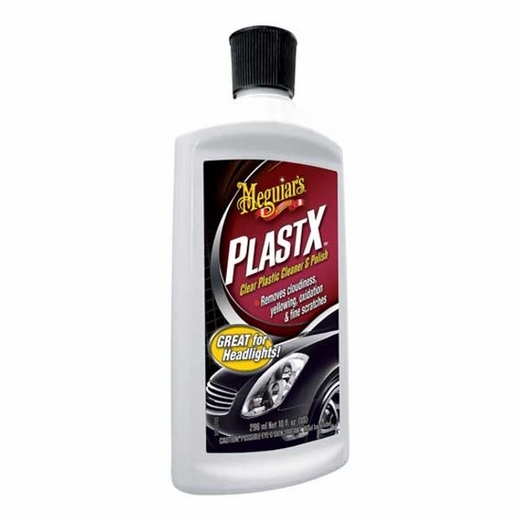 Cutting-edge advancements in Meguiar�s exclusive Microscopic Diminishing Abrasive® Technology (MDAT) remove light oxidation, chemical degradation, surface contamination, stains and light surface scratches with ease. Special highly water resistant polymers provide long lasting durable protection to keep your clear plastics clear and beautiful longer. We recommend applying PlastX® with a High Tech Applicator Pad or Ultra Plush Super Terry and using an Ultra Plush Super Terry or Supreme Shine® Microfiber for the final wipe-off.